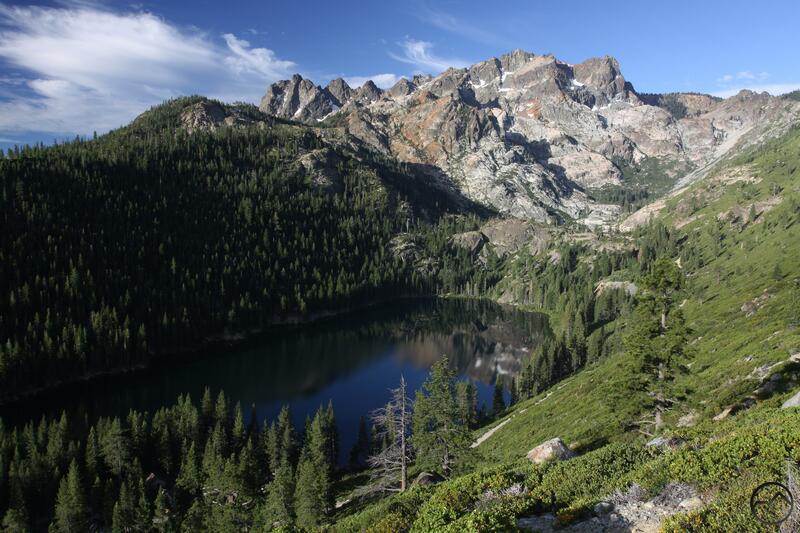 The magnificent Sierra Buttes rise above the Sardine Lakes. 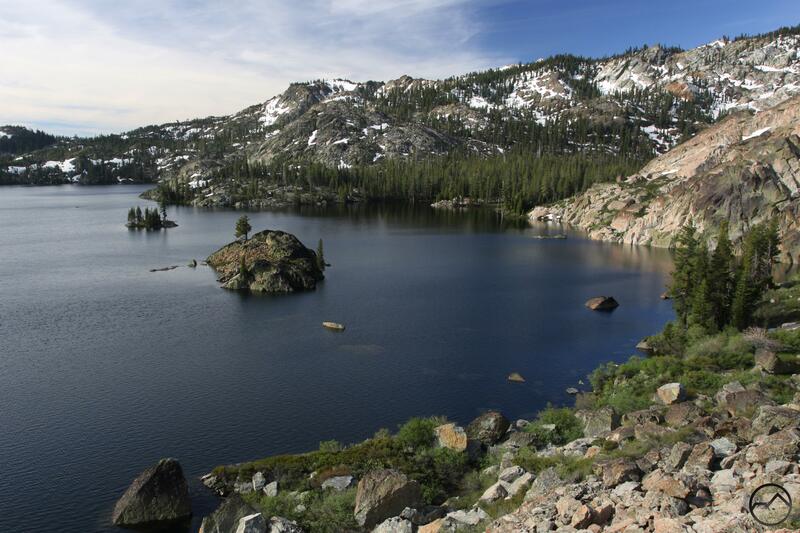 One of the northernmost outposts of rugged, alpine terrain in the Sierra Nevada, the Lakes Basin area is a fantastic hiking, camping, kayaking and mountain biking destination. Boasting nearly 4 dozen named lakes and numerous unnamed tarns, this area lives up to its limnic name. Most of the lakes are set beneath rocky cliffs, which make the area a scenic feast for those who come to enjoy this excellent mountain region. While most of the area is rugged, it is not particularly craggy, with only a few notable mountains make an appearance. Instead, the area exhibits its asperous nature in a more friendly manner. The cliffs are tall, but not exceptionally so. The lakes are varied in size and set in accessible basins, some of which are low and can be driven to while others are high and require long hikes to reach. It is this balanced but beautifully rocky nature that makes the Lakes Basin area such a fantastic hiking destination. Dozens of lakes and rocky terrain abound in the Lakes Basin area. In a broad perspective, the northern Sierra Nevada can roughly be defined as that part of the Sierra Nevada that begins at Carson Pass, includes the Lake Tahoe Basin and continues north 120 miles to Lake Almanor. Compared to the parts of the Sierra Nevada that lie further to the south, this area is typically more subdued and less wild than the vast wilderness of jagged mountains that is the signature of California’s signature mountain range. While there are some fantastic mountains around Lake Tahoe, the subdued trend becomes more evident the further north you go. Despite this, the Lakes Basin area appears to be an island of craggy, glacially carved terrain. It is surrounded by decidedly less rocky, less rugged mountains in nearly every direction. Quartz porphyry cliffs above Long Lake. Geologically the area is something of an island as well. 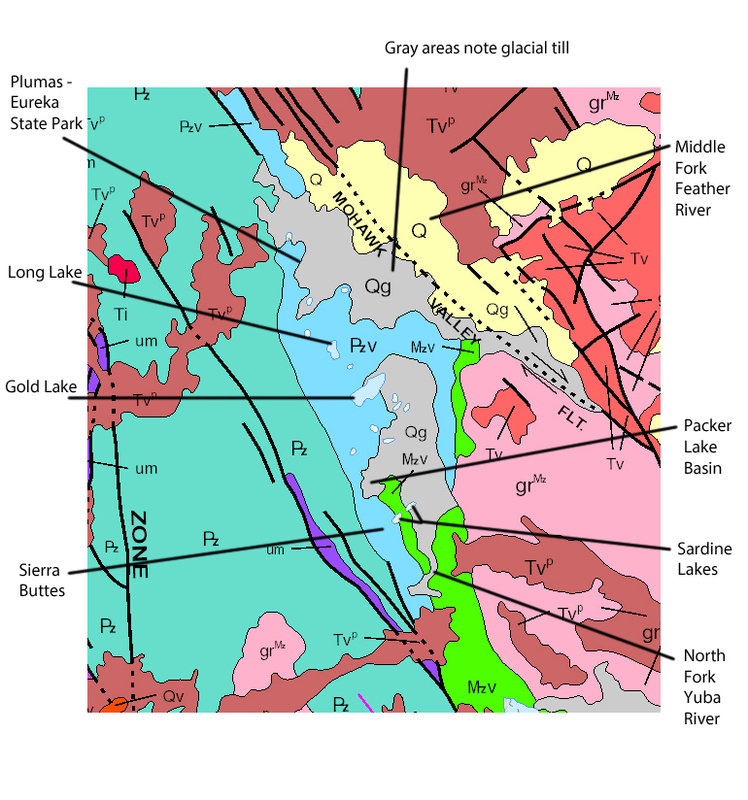 Most of the exposed rock in the Lakes Basin area is composed of quartz porphyry. This is situated between an extensive area or marine sediment to the west and a large granite pluton to the east. The confused geologic structure of this area is common in the northern Sierra Nevada. Rather than consisting of a single granite pluton like most of the range to the south, the mountains in this region are a seemingly random mixture of a variety of rock types. In spite of this, the composition of the cliffs at the Lake Basin area are distinct, with few other examples of it anywhere nearby. It is the quartz porphyry that gives the cliffs their white to pink range of colors and the area’s visual distinctiveness. Most of the Lakes Basin area appears in light blue, which indicates quartz porphyry. The gray areas are the glacial till, grindings left by glaciers that carved out the basins. The turquoise area on the left is marine sediment. The pink denotes granite plutons. Sierra Buttes view of Packer Lake basin. The Lakes Basin area is situated on the divide between the Middle Fork of the Feather River and the North Fork of the Yuba River. Strictly speaking, the Lakes Basin proper lies at the northern end of this glaciated area, focused on the basin containing Long Lake. However, the area is geologically cohesive and glaciation and lakes abound, making the name Lakes Basin appropriate to the whole area. In total, there are 6 primary lakes basins here. From north to south, these are the Jamison, Lakes Basin (proper), Gold Lake, Salmon Lake, Packer Lake and the Sardine Lake basins. 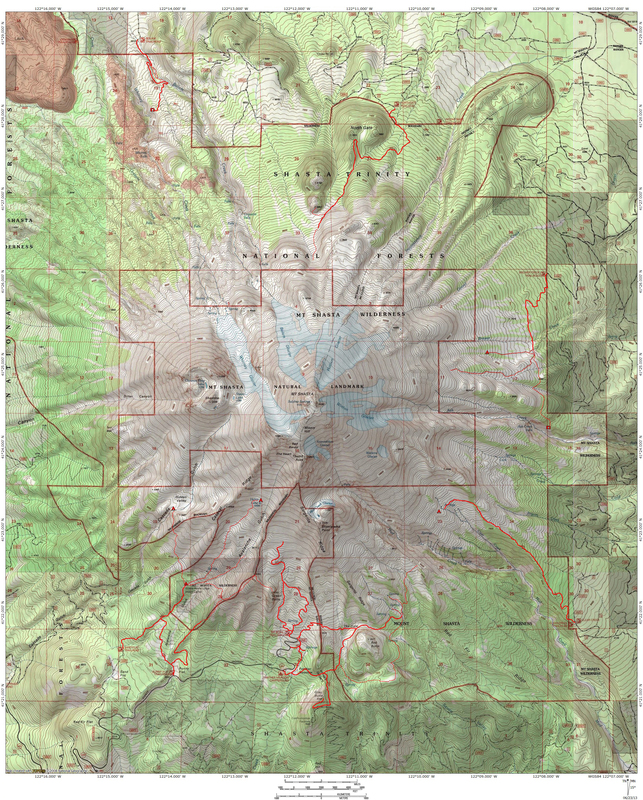 Worth noting, the Lakes Basin proper, which is around Long Lake, is the centerpiece of the Lakes Basin Recreation Area, which has several improvements including multiple trailheads, and campground and a good trail network. It is this specific area that lends its name to the whole region. Mount Elwell looms above Long Lake. 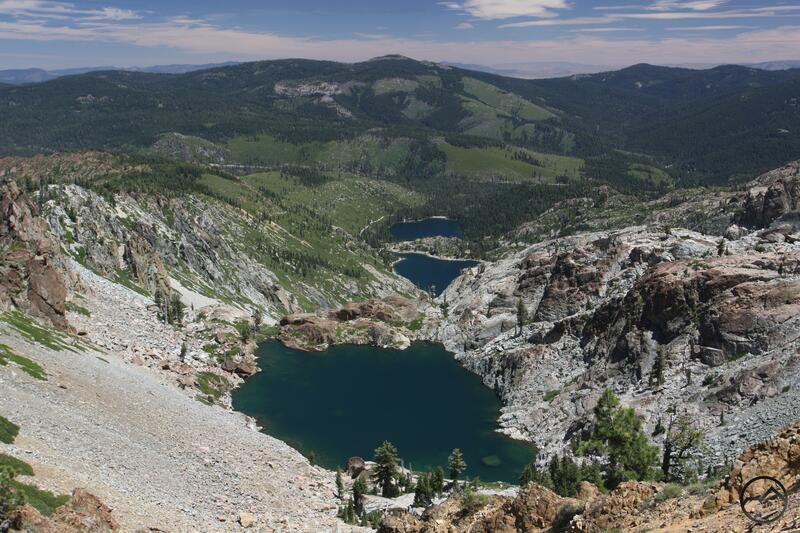 Despite the extensive glacial activity that occurred in this area and the proliferation of steep cliffs above the lakes, there are only a couple of particularly notable peaks in the Lakes Basin area. In the north, rising above Long Lake and the Lakes Basin proper is Mount Elwell. At 7,818, it is one of the tallest peaks in this part of the Sierra Nevada. 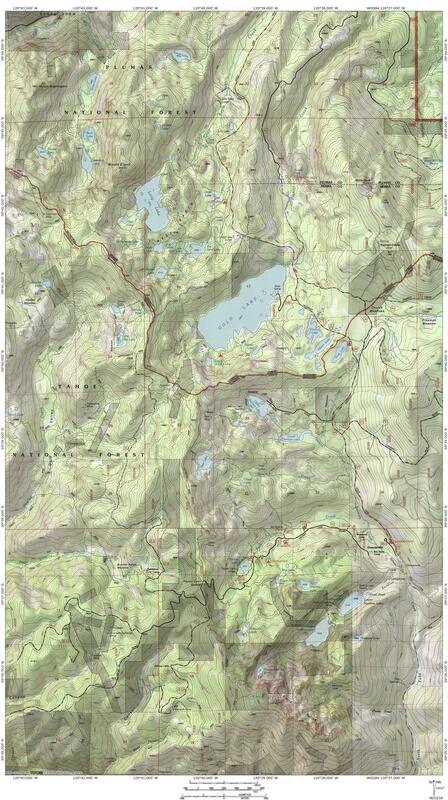 However, it is the massive Sierra Buttes, anchoring the southern end of the Lakes Basin area, that really stands out. Soaring to majestic 8,587, this spectacular collection of peaks, cliffs and spires is easily the most magnificent mountain between Lassen Peak and the Desolation Wilderness, adjacent to Lake Tahoe. Not only are there plenty of lakes and some rugged topography, there are also some excellent waterfalls to be found in the Lakes Basin area. There are several attractive cataracts on Gray Eagle Creek, many of which are accessed as part of the trail network that rings Long Lake. Some quality cascades are also to be found at the Sierra Buttes, especially between the Sardine Lakes. 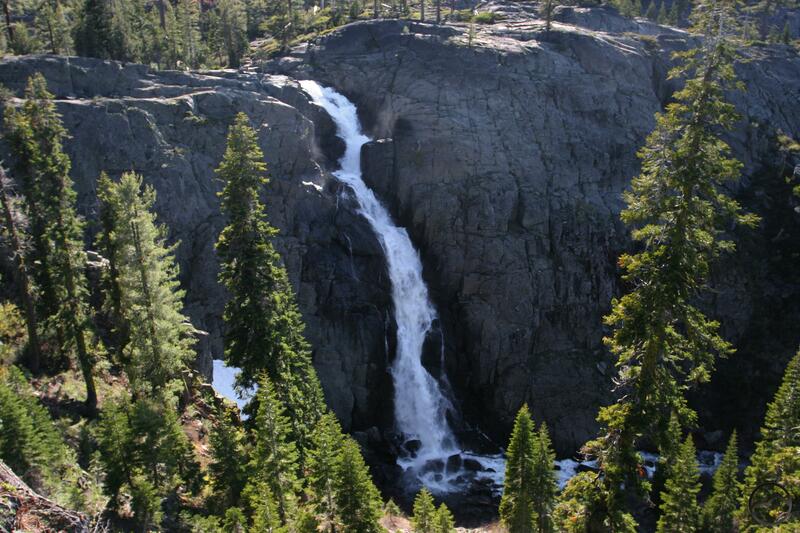 However, the most notable waterfall in the Lakes Basin area is Frazier Falls. Dropping 175 in a succession of vertical cascades, it is one of the tallest waterfalls in the entire northern Sierra. The falls are accessed by an easy 0.5 mile trail. Upper Tamarack Lake, a great OHV destination. 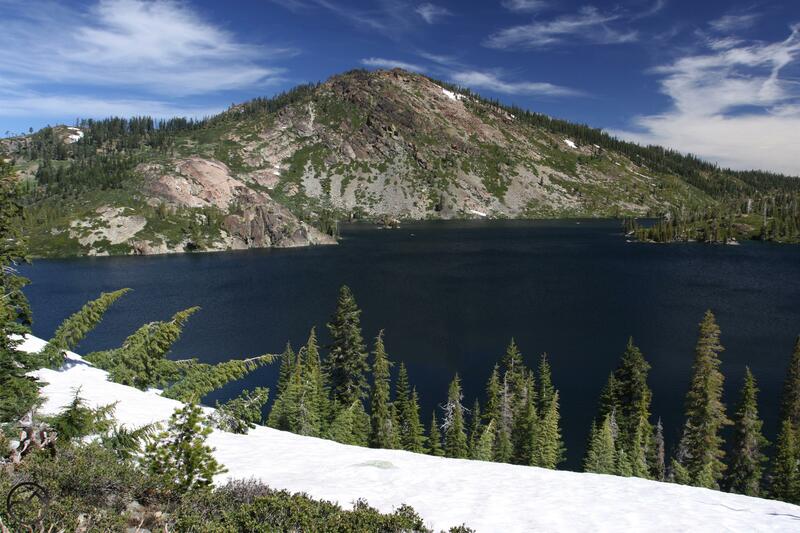 As noted, the Lakes Basin area is a fantastic area for a whole host of outdoor activities. The lakes offer fantastic paddling opportunities while old mining roads provide some great routes for OHV enthusiasts. Mountain biking is increasingly popular area, especially the southern end by the Sierra Buttes. Here shuttles will drop bikers off at the top of the ridge just north of the Sierra Buttes and they can then descend a series of trails and dirt roads all the way down to Downieville, as descent of over 4,000 feet. Also worth noting is the presence of the Pacific Crest Trail, which traverses the entire area along the crest of the ridge. For the most part the PCT does not access any of the lakes and is used primarily by thru-hikers rather than by hikers accessing the lakes. 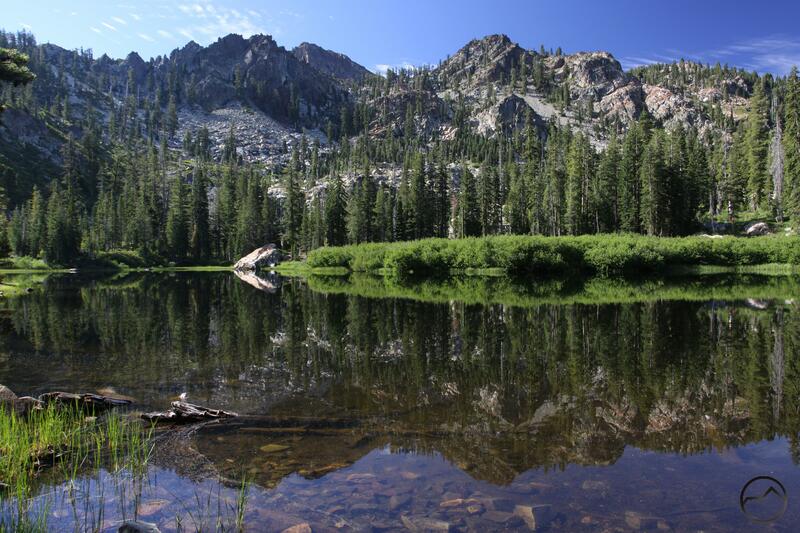 Despite all the other activities, it is the hiking trails that offer the best way to explore the Lakes Basin area. The Salmon and Jamison Lakes basins have great, scenic trails winding through them and are good destinations for hikers. However, it is the Sierra Buttes area and the Lakes Basin Recreation Area that really commands the attention of those looking to get on the trail. The former, located in the south, features a long, epic hike to the top of the Sierra Buttes where a marvelously exposed fire lookout stands at the edge of the void. 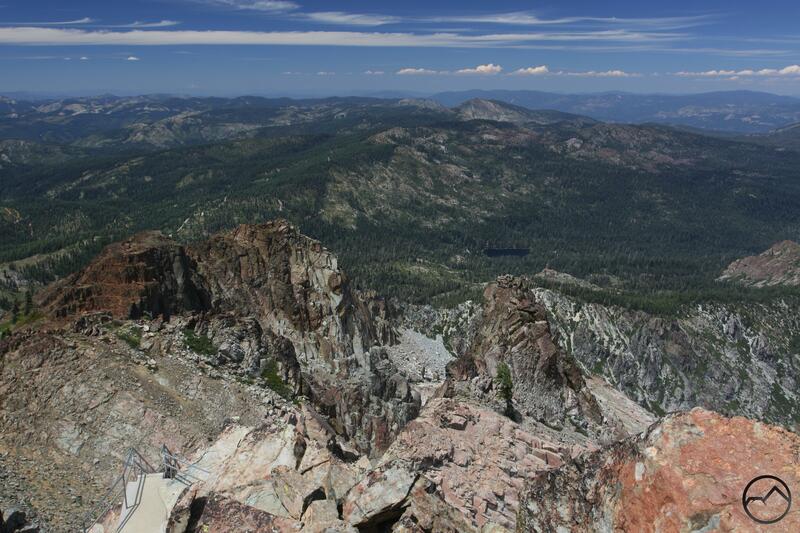 This is a classic Sierra Nevada hike, akin to famous hikes like climbing Half Dome. At the north end of the area is the Lakes Basin Recreation Area. This has the most well-developed trail network, which access all the lakes in the basin as well as climbing to the summit of Mount Elwell and connecting to the Jamison Lake basin. With its great trails and gorgeous scenery, the Lakes Basin area is a fantastic destination for hikers. While it is not an unknown destination, it sees far, far fewer visitors than the Lake Tahoe or other Sierra Nevada destinations further south. Of those who do come to the Lakes Basin area, a significant portion are there to paddle, bike or fish, leaving the trails with that many fewer people on them. 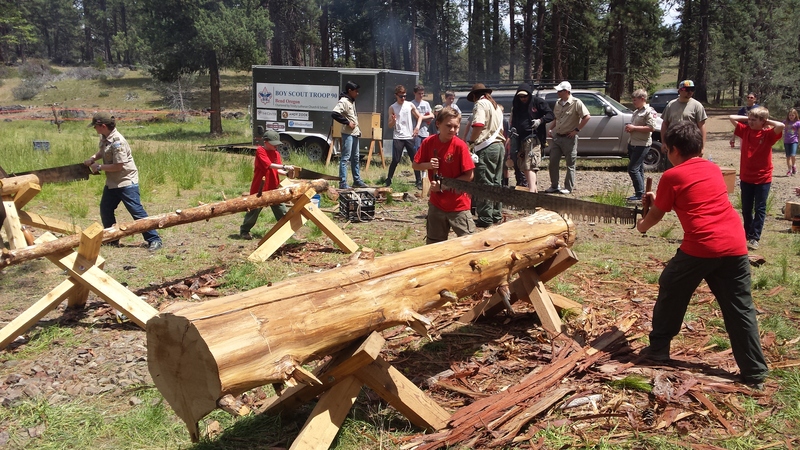 Despite this, there are ample campgrounds and even a few lodges, making the area easy logistically. For those who do make the trip, the lovely lakes and the soaring towers of the Sierra Buttes are unforgettable. Sierra Buttes above Lower Sardine Lake. Looking toward the summit lookout tower on the Sierra Buttes. Mount Elwell above Long Lake. Mud Lake and Mount Elwell. Falls on Gray Eagle Creek. The Sacramento River flows under the Lake Siskiyou Trail’s seasonal bridge. This is probably late news, but I have not been here to update conditions lately. However, I reckon it is best to mention it than to not. The seasonal bridges over the Sacramento River have finally been installed. 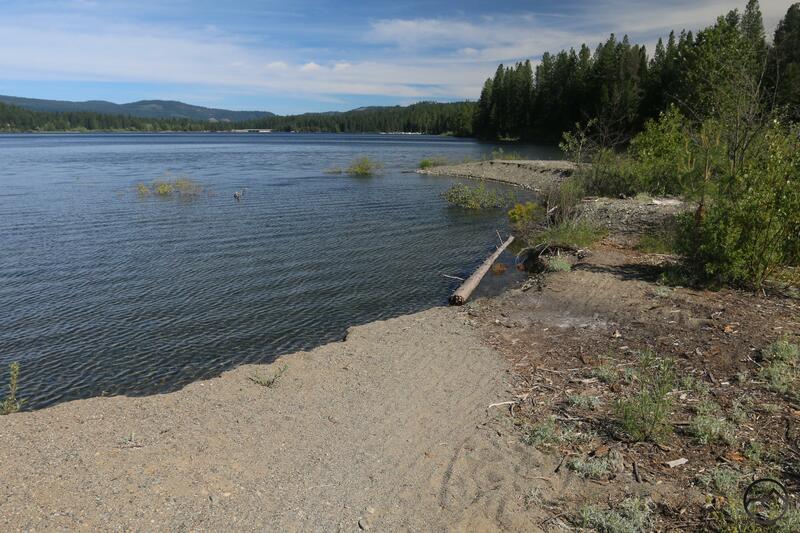 This means that the Lake Siskiyou Trail is once again a complete loop. It is now possible to hike or bike the complete circuit around the like. 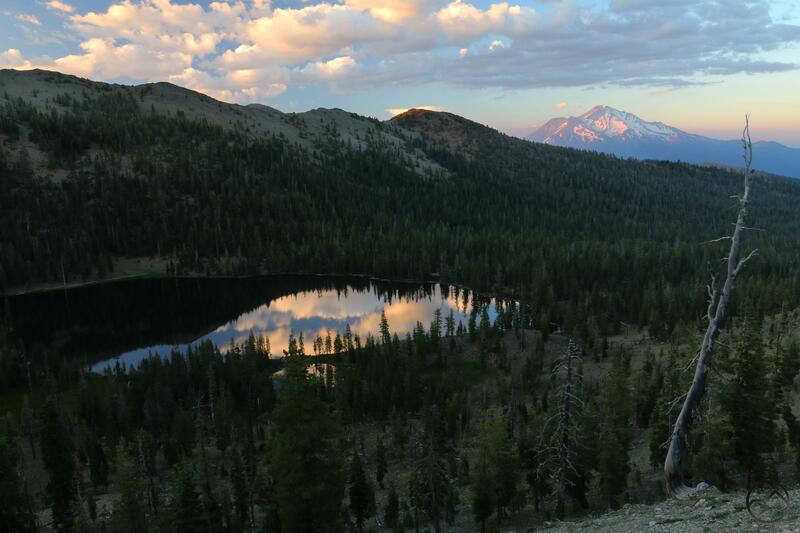 This easy trip is a classic Mount Shasta hike. It may not be the wildest trail in the region but it has lots of interesting features, is easy for the whole family and has some great views. It is necessary for the bridges to be seasonal because of the constantly shifting terrain at the inlet. The last several years have seen dramatic changes to the inlet geography, with a significant amount of land simply washed away and the routes of the river’s channels changed considerably. 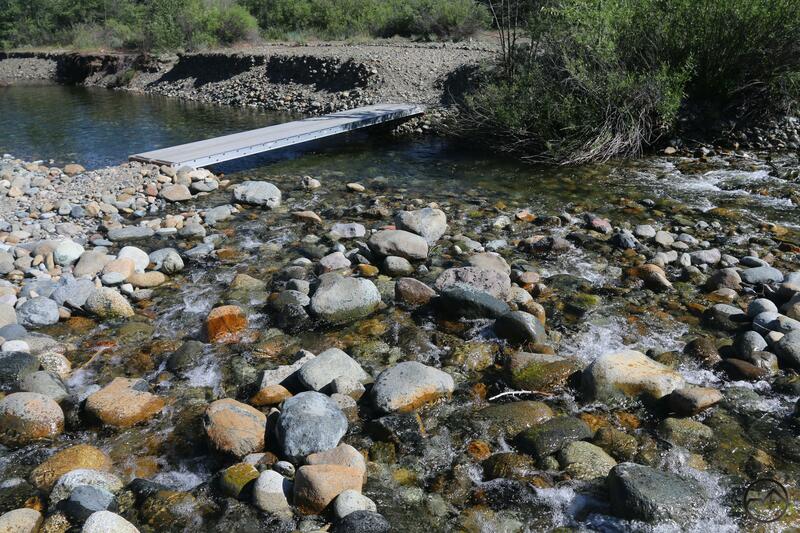 During a drought year a few years ago, the bridges were left in since the water level was so low and they were then lost when a sudden storm washed everything away, leaving only some twisted gabions as a reminder that the bridges has once been there. Washed out section of trail. This year there was relatively little change at the inlet. 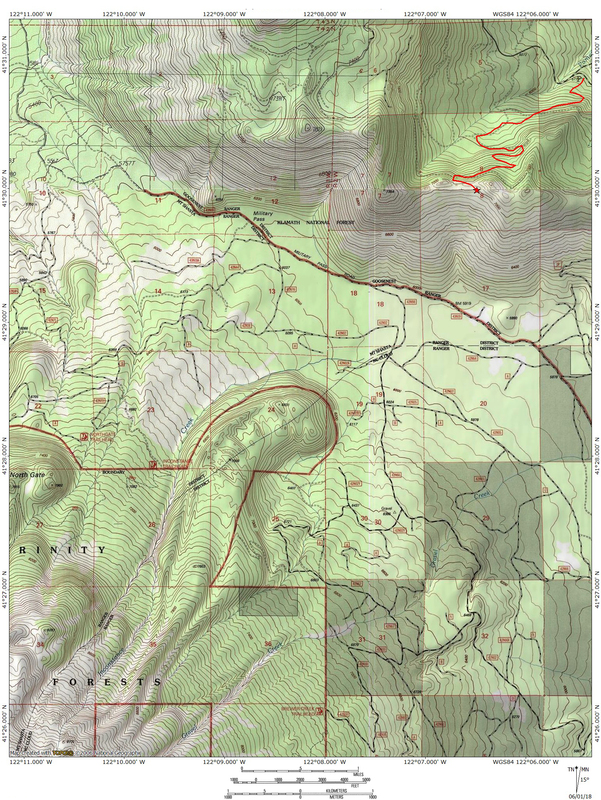 The most significant being the loss of a section of the Lake Siskiyou Trail on the the southern bank of the northern channel (I know that sounds confusing!). For the last few years the trail crossed a narrow isthmus between the lake and a small seasonal pool of water. The lake shore has encroached on the trail, washed away the isthmus and forced the trail inland a little, crossing the now dry pond. Also, like last year, the once dry south channel (which was, at one time, the Sacramento River’s main avenue to the lake) has a small flow of water in it. Perhaps one day the river will return to this channel in earnest. Now the final piece of the Mount Shasta hiking puzzle is the opening of the road up to the Old Ski Bowl. I’ll be in Hells Canyon when that happens but I will still post something about the conditions of that area when I return from that upcoming trip. In the meantime, get out and enjoy all the trails that are open now! 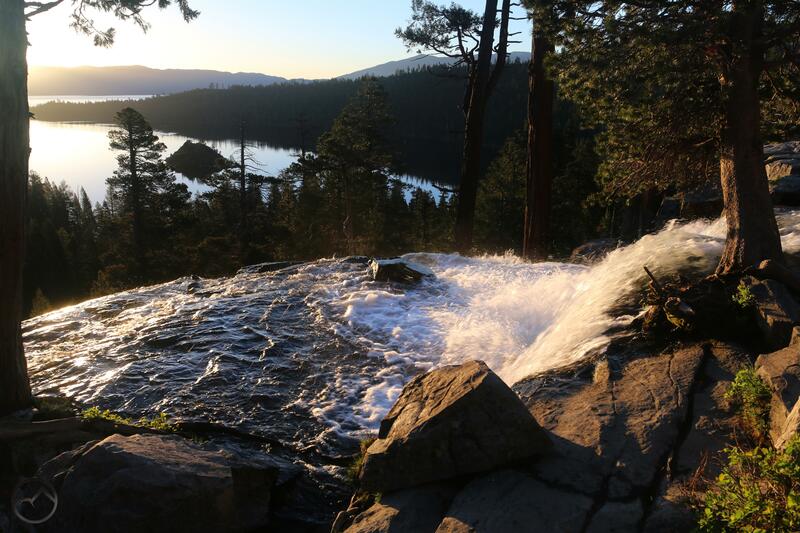 Sunrise over Lake Tahoe, Emerald Bay and the top of Eagle Falls. Things have gone silent on Hike Mt Shasta for most of the first half of June. I have had a number of posts planned but all those were put on hold since I took my family on a camping trip down to Yosemite, Lake Tahoe and other parts of the Sierra Nevada. For reasons beyond our control, it was a challenging trip but we persevered through the difficulties and it ended up being a great trip through some of the most beautiful places in the world. It was especially gratifying to see my kids getting a chance to have experiences in Yosemite and beyond, like I did when I was their ages. While I have deep personal connections to Yosemite through my family history, I want my kids to know more about the Sierra Nevada beyond that fabled park so we are making it a point that they become familiar with many parts of that most superlative mountain range. The Hike Mt Shasta kids loved it and had a grand time in spite of the challenges. We even had time to visit the Western Pacific Railway Museum in Portola on the way home, where my youngest son (3), the self-proclaimed “choo-choo boy” was in absolute heaven. It was a great experience for all of them and I am proud of how they did despite some unexpected adversity! I am including a gallery of some of the stuff they did. Hopefully this weekend I will be able to put a few summer-oriented posts up too! 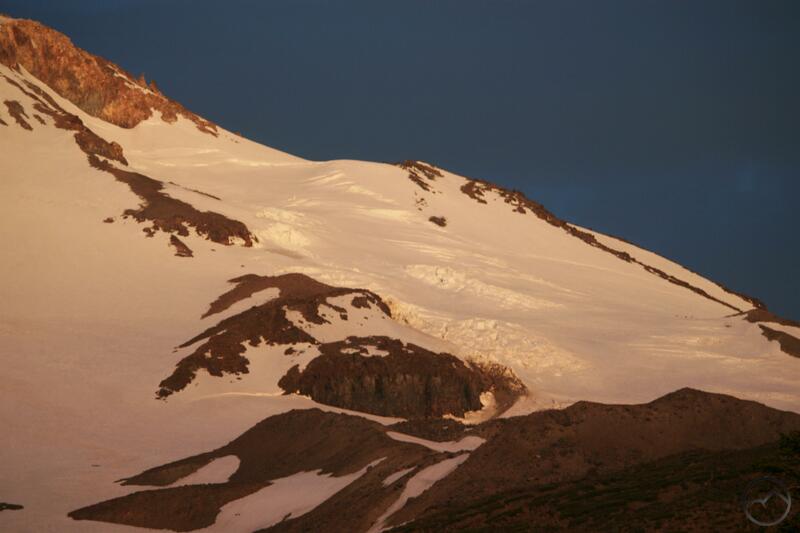 The massive Hotlum Glacier clings to the upper flanks of the northeast side of Mount Shasta. 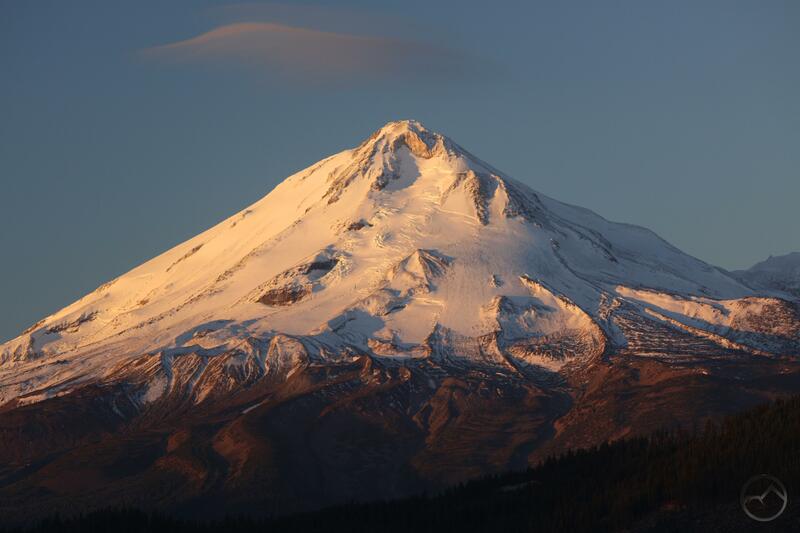 Mount Shasta is home to the 4 largest glaciers in California. On the northern slopes one can observe the Whitney and Bolam Glaciers while on the east side are the Hotlum and Wintun Glaciers. Of these two eastern glaciers, the Hotlum is the most notable because it is California’s largest glacier. The vast field of ice extends 1.25 miles down the side of the mountain, descending about 3,000 feet. Measuring the combined width of its multiple lobes, the Hotlum Glacier is nearly 1 mile wide at its base. It really is a singularly impressive sheet of ice. Yet, despite being notable for all of these reasons, there is another reason, more difficult to discern and more mysterious than the others. This is the fact that the Hotlum Glacier is the only glacier in California to have an extant medial moraine. This may sound somewhat anticlimactic, so please allow a quick digression to explain what a moraine is. As glaciers form they begin to move downhill. The massive blocks of ice carve, scour and cut away at whatever feature lies along their path. This slow, gradual grinding away at the landscape is what has formed such famed landmarks at Yosemite Valley and the Kiger Gorge on Steens Mountain. However, all the debris that is worn away by the passage of the glacier is moved along with the glacier, pushed aside by the downhill motion. Debris is also pushed by the head of the glacier as well. These are called lateral and terminal moraines, respectively. Medial moraines do not typically forms on small or moderately sized glaciers. They are the domain of the great glaciers, the long rivers of ice that flow from mountains at extreme latitudes or altitudes. In terms of glacial activity, California is far to the south of where most of the conditions exist for extensive glacial activity. The Sierra Nevada has a few glaciers, but most are just vestigial remnants of the vast ice fields that once covered that mountain range. Furthermore, any evidence of medial moraines, assuming there were any, has long since been washed away. 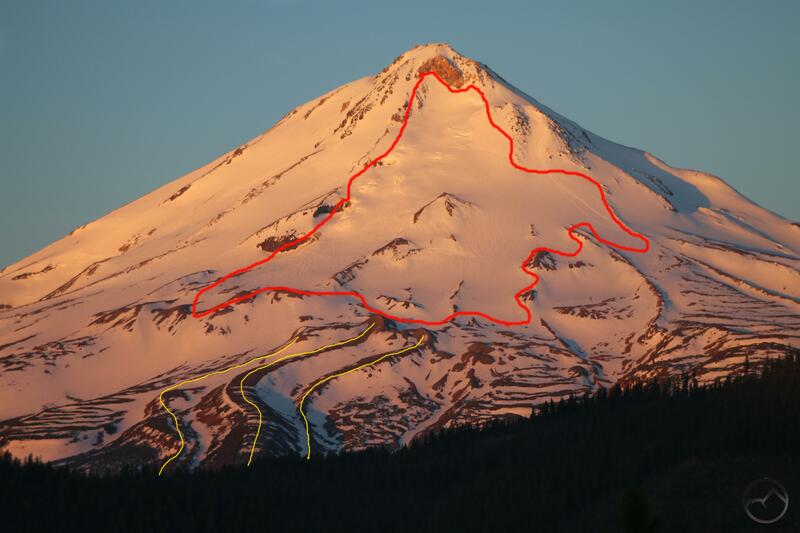 Only on Mount Shasta, and only on the Hotlum Glacier is there evidence of such a feature in California. The red marks the current extent of the Hotlum Glacier. The yellow lines mark medial moraines. Southern, larger flow of the Hotlum Glacier. 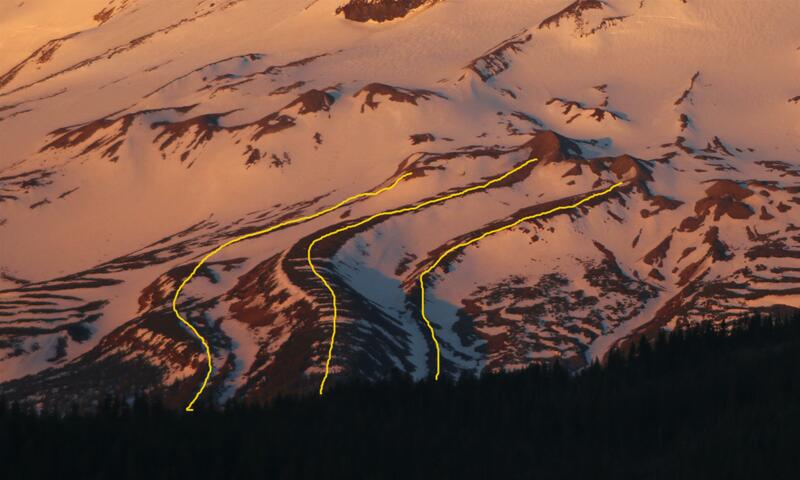 Today, just as it must have done in the past, the Hotlum Glacier splits in two, descending down the flanks of Mount Shasta in two large segments. These are separated by a large rock outcropping that divides the flowing ice. Something similar, though no doubt larger, must also have taken place in the past, for just below this large outcropping is the beginning of the medial moraine. It would appear that this protruding rock divided the glacier into two large flows. Below the rock protrusion the flows converged again, this time carrying the debris carved away from Mount Shasta by the glacier. This debris was then carried downhill as the ice slowly crept its way down the mountain. As all glaciers at this latitude have done over the last several millenia, the Hotlum Glacier has receded. This has left the medial moraine isolated from the ice that created it. Nonetheless, the geology is still evident and it is easy to envision how much larger the glacier was in the not-too-distant past. If we accept the terminal moraine, which lies at the end of the medial moraine, to represent the full extent of the glacier’s size, then the massive ice sheet would have extended almost 6 miles down Mount Shasta, descending 7,500 feet over its journey. This would have been a truly staggering chunk of ice. 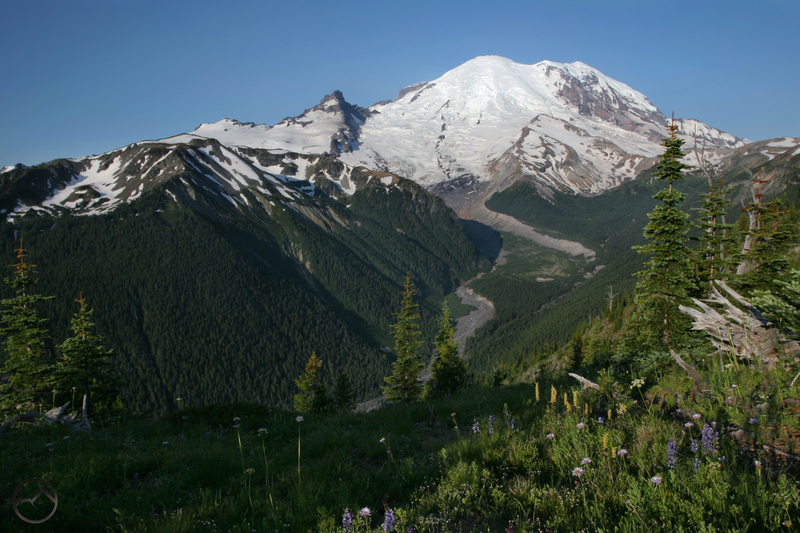 Its measurements would have significantly exceeded Mount Rainier’s Emmons Glacier, the largest glacier in the coterminous United States. It must have been a magnificent sight to behold. Observing the massive, slow-moving river of ice rising just below Mount Shasta’s summit and creeping all the way down to its lower flanks. Indicative of its size, there was not just one medial moraine on the Hotlum Glacier. The primary one was the largest but it was flanked by two smaller, parallel moraines. They follow the same path of flow and feature the same, distinctive sweeping curve in the first quarter of their length. Indeed, it is this curve that makes the nature of the moraines apparent even to the untrained eye. It is easy to visualize only the top of these moraines visible of the large field of ice that surrounded it. The upper section of Mount Shasta’s medial moraine. With the lack of ice surrounding the moraines now, it is not as easy to recognize them at every angle. While their upper reaches extend above the treeline, the preponderance of their bulk is now below this point and is forest cover has taken root midst the rocky terrain. The moraine are also long and low, which does not cause them to stand out from most angles. Nonetheless, once an observer understands what to look for, the medial moraines become much more apparent. Viewed from North Gate plugs. The medial moraines aren’t the only ones that remain to testify to the former scale of the Hotlum Glacier. Both of the main halves of the glacier have below them large fields of smaller, successive terminal moraines. As the glacier receded it would periodically advance again, covering a short distance and pushing a small pile of debris forward before it would melt and shrink again. This is what has caused the distinctive wave patterns around the treeline areas near the medial moraines. The smaller of the two fields lies below the larger of the Hotlum Glacier’s two current halves. However, there are several fields of terminal moraines in the area between the medial moraine and the Hotlum-Bolam Ridge, which seperates the Hotlum Glacier from the Bolam Glacier. The fields of terminal moraines are a dramatic retelling of the Hotlum Glacier’s story, of massive growth and then a protracted age of advance and recession, finally leading to today’s diminished-but-still-massive glacier. There are not many vantage points that yield good views of California’s lone medial moraine and it has largely gone ignored, overlooked or unappreciated. Despite this, it is one of the most fascinating geologic features not just on Mount Shasta, but possibly in all of California. Only places like Yosemite Valley offer a correspondingly easy-to-understand visual of the power, nature and scale of the glaciers that once covered the majority of the mountains of the Golden State. A great way to remedy this would be the construction of a “Moraine Vista Trail”. There is the ridge south of the Whaleback and immediately east of the moraine offers spectacular views not just of the medial moraine but also of the entire east side of Mount Shasta, which is the least viewed and least appreciated side of the mountain. There is good, paved road access and the land is in the midst of a logged area, which means it is unlikely to be used for little else. It would be great to build a pathway that could be used to educate people on California’s glacial past, present and possible future. It would also give hikers a chance to enjoy a new area and views of the mountain that are currently available the few who venture onto that side of the mountain. Such a trail would be a marvelous addition to the Mount Shasta area’s trail network!